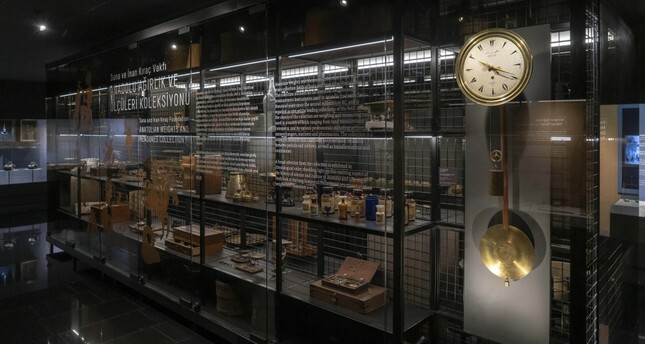 The clock, whose pendulum was repaired and restored thanks to this project bringing together two veteran names, awaits visitors at the Anatolian Weights and Measures collection at Pera Museum. "Mechanical clock no. 31," made by Ottoman clock master Mustafa Şem'i Pek, was placed in Pera Museum's Anatolian Weights and Measures collection, one of the three major collections of the Suna and İnan Kıraç Foundation and is open to enthusiasts of history, art and archaeology to see. Born in 1870 in Istanbul, Mustafa Şem'i Pek is known to have made clock towers, large facade clocks and square clocks. He was the leading clockmaker during the reign of Sultan Abdulhamid II, and later, the first years of the republic. Now, a clock made by Pek has been restored by Recep Gürgen, one of the clock masters in Turkey, and has been included in the Pera Museum show. The clock, whose pendulum was repaired and restored thanks to this project bringing together two veteran names, is awaiting visitors at the Anatolian Weights and Measures collection. One of the greatest clockmakers of the latest Ottoman period, Pek taught mathematics at the Sultanahmet High School while manufacturing clocks at his workshop at the school. He trained his pupils in this workshop and shared his clocks with German technicians, engineers and mathematicians who visited Istanbul. The facade clocks at Haydarpaşa Train Station, Istanbul University, Haydarpaşa High School, Maritime Lines, Bakırköy Mental and Neurological Diseases Hospital's tower clock and several other main and facade clocks in the city were made by him. Standing out with his use of high-quality materials and craftsmanship, Pek became systematic in manufacturing clocks customized for Western requests; prepared the first catalog containing information on labor, wages and materials and also built electric clocks. Recep Gürgen, the man who repaired Pek's clock for the museum, got his start in this profession in 1960 with his uncle. He was trained by Wolfgang Mayer, the palace clockmaker of Sultan Abdulhamid I. When Mayer was working on a book on clocks at the Topkapı Palace, Gürgen prepared a chapter with him and continued repairing the clocks of Topkapı Palace afterward. Gürgen, who continues his works at his workshop in Istanbul's Karaköy district, which he opened with Mayer's encouragement, transfers the delicacies of this profession to younger generations. Gürgen believes that "there is no clock that cannot be repaired" and he has restored many clock towers, faithful to their originals. Gürgen has repaired approximately 40,000 tower and facade clocks, clocks and watches since the 1960s. One of the three major collections of the Suna and İnan Kıraç Foundation, the Anatolian Weights and Measures collection provides insight into the history of Anatolian science and cultural history and commercial practices, based on the weights and measures used. Considered to be one of the most important in this field, the collection includes weights and measures used in various fields from land measurement to shopping, from architecture to money changing, from maritime to pharmacy. A part of the Anatolian Weights and Measures collection of nearly 10,000 works, also includes digital animations that refer to the trade and production life of the period, its commercial roads, agreements and use of toys.